A lot of places across the U.S. can lay claim as the happiest city in the country. Although not a completely objective list, National Geographic set out to determine which ones were truly the “happiest” based on measurable criteria. These are the top 5 of the places that made the cut in 2017: Boulder, CO; Santa Cruz-Watsonville, CA; Charlottesville, VA; Fort Collins, CO; and, the San Luis Obispo-Paso Robles-Arroyo Grande metro area, CA. Access to green spaces, waterways, and parks. Just 25 miles due northwest of Denver, the capital city of the State of Colorado, is the city of Boulder. Boulder, with a population of just over 100,000, is consistently listed as one of the best cities to live in. It is where the great plains and the Rocky Mountains come together to form some of the most beautiful scenic landscapes in the United States. What makes Boulder such a happy place to be? Well, who wouldn’t be happy living in a city that experiences about 300 days of sunshine a year? The area’s moderate weather makes outdoor mountain living possible. The city has an elevation of more than 5,400 feet, situating it 150 feet higher than the mile-high city of Denver. Its population is made up of 30,000 students that attend the University of Colorado, the state’s flagship university. Sun. Music. Ocean vistas: these are just some of the elements that make the population of the Santa Cruz-Watsonville, CA metro area one of the happiest. It is an area on the northern edge of the Monterey Bay peninsula and is just 32 miles to the south of the city of San Jose. There is plenty to do and see in this city of just over 62,000 residents, home to the University of California-Santa Cruz and its famous mascot, Sammy the Slug (made famous in the movie “Pulp Fiction”). Whether it’s a stroll on the boardwalk, taking in the beauty of the many Spanish missions, or enjoying the eateries along the bay, there’s plenty here to make residents and visitors alike happy. 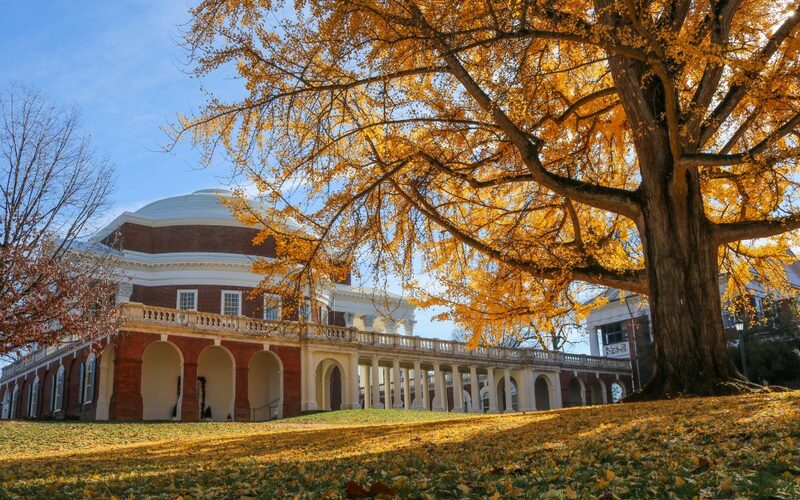 Charlottesville has become synonymous with the University of Virginia. The university and its nearly 25,000 undergraduate and graduate students have called Charlottesville home for the past 200 years. It is a particular point of pride that the school was founded in 1819 by the third president of the United States, Thomas Jefferson. Charlottesville is a small and quaint place to live; its population of 48,000 residents has often been called one of the friendliest in the country. But what attracts people to Charlottesville, beside the university? Despite its size, many people have found quiet and active pastimes: whether it’s strolling through its historic downtown mall, hiking in the Blue Ridge Mountains, or visiting one of the dozens of wineries or breweries in the area, there’s something for everyone. Another Colorado city that made it onto National Geographic’s top five list, at number four, is Fort Collins. 161,000 residents call Fort Collins home. The city is also home to Colorado State University and its 25,000 students. A main attraction that you can find is its craft beer industry, which produces more than 70 percent of the craft beer made in Colorado. And who wouldn’t want to live in a place that produces so much beer? San Luis Obispo-Paso Robles-Arroyo Grande metro area is the name for the largest metropolitan area located in San Luis Obispo County, California. The cities, together, have a population of over 260,000 residents. They are located at the midway point between the major cities of Los Angeles to the south and San Francisco to the north. California Polytechnic State University (“Cal Poly”) is located in this metro area, along with its 21,000 students, which help bring a young vibe to the metropolitan area. One of the most popular attractions that makes San Luis Obispo-Paso Robles-Arroyo Grande a happy place to live is its wineries and many wine tastings. Add the Christopher Cohan Performing Arts Center on the campus of the Cal Poly and a budding arts scene, and you will find this a pleasant place to be. It is easy to see why these five cities top the list of happiest places to live in the U.S. What these cities share in common are a youthful university population, contributing to the intellectual capital in each of these communities. This is not the only factor; looking at the metrics determined by National Geographic, these five cities have many subjective and objective qualities that they share in common. What the five top cities share that make them the happiest are high marks in personal pleasure, a pride in the community, and a sense of purpose. It also helps that these five cities are bikeable communities, have a low rate of crime, and have access to clean air and clean water (in fact, the correlation between access to clean water and happiness is strong). These factors increase the happiness of its residents and make them places that more and more people want to visit. Want to know more about your neighborhood? Plug an address into NeighborWho’s property finder and see what you can find!